Symbolic to all the success we have acquired in the industry, remains our status as a prominent enterprise engaged in offering PVC Plumbing Pipe. These pipes are manufactured as per ASTM D 1785 and supplied in 3, 5 & 6 meters length with one end having male threads & the other end having female threads. 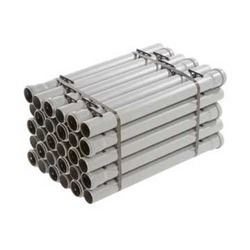 These pipes are well accepted by the users everywhere for plumbing, water distribution and particularly in deep tube well connection because of higher collapse strength. 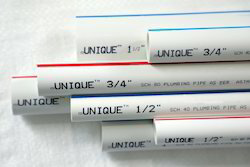 We are offering our client an excellent quality range of PVC Plumbing Pipes. These are made from very high quality raw material which ensures high durability at its user end. These are in high demand in the market. Different sizes and designs are easily available with us in ready stock. We are the leading name in the market engaged in offering a wide assortment of Plumbing Pipes, which is used in potable water supply schemes, domestic, industrial plumbing and chemical transportation. Developed by premium grade raw materials under strict quality supervision these pipes are offered in various sizes.